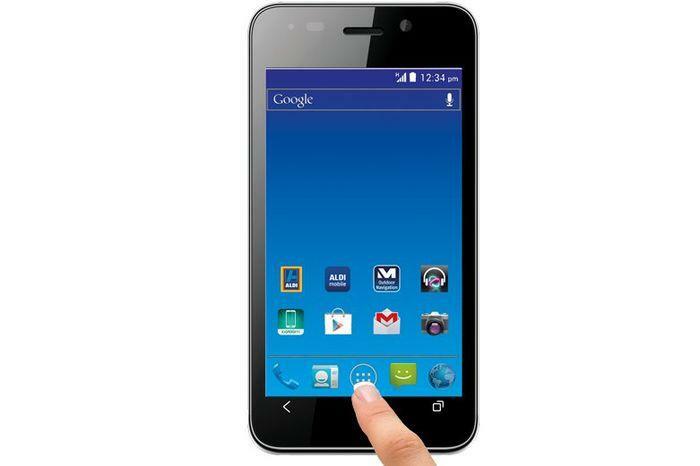 The Medion E4002 smartphone, which goes on sale from Saturday, 2 November. In what appears to be a bid to clear excess stock, Aldi's current catalogue advertises a Medion-branded 4in, 3G Android smartphone with dual-SIM capabilities for $129. It will go on sale from Saturday, 2 November. The Medion E4002 smartphone has a 4in touchscreen with a resolution of 800x480, is powered by a 1GHz dual-core processor and 512MB of RAM, and includes 4GB of internal memory. The handset is identical to the one the supermarket chain advertised back in July, though at that time the device sold for $149. The Medion E4002 supports the 850MHz and 2100MHz 3G network bands in Australia, so it's suited primarily for use on the Telstra network. However, the second SIM card slot only supports 2G networks. The handset also has a microSD card slot for memory expansion, a 5-megapixel rear-facing camera and a VGA-front facing camera for video calls. It runs the 4.1 Jelly Bean version of Google's Android operating system, comes with a 1500mAh battery, and is powered by a 1GHz dual-core processor. Aldi has advertised the E4002 as "limited special buy" product and says stocks will vary between stores. The supermarket chain also says that the phone may sell out on the first day due to "unexpected high demand." "While stocks last - please note stocks are limited and will vary between stores. Despite our careful planning, we apologise if selected items may sell out on the first day due to unexpected high demand." "In the event of unexpected high demand, ALDI Stores reserves the right to limit purchases to reasonable quantities." Medion provides a one year warranty with the Android smartphone, while Aldi says it will refund or replace any product within 60 days, provided it obtains a proof of purchase. The Medion E4002 undercuts a budget Android smartphone that Australian online retailer Kogan began shipping earlier this month. However, that device boasts superior specifications including a larger 5in 720p HD touchscreen, and a faster 1.2GHz quad-core processor. Are you interested in low cost Android phones? What do you think of the Medion E4002? Let us know your thoughts in the comments below!